It’s time to look at an interesting video game collection known as the NES Remix Pack. It brings both NES Remix 1 and 2 which is a pretty good deal since both of those titles had quite a lot of content in it. The price isn’t bad for the collection as I got it for 20-30 as well and it’s roughly triple the length of Sonic Forces. It’s definitely fun to see them mashup the games in Remix mode or even the mini challenges from the classic games. It’ll really test your knowledge of the older Nintendo titles. The main mode is pretty self explanatory in these games. You’ll start off with a few options like Mario Bros, Donkey Kong, and Mario 2 for example. Each of these games will have 7-20 levels depending on which game it is. You try to beat each level where your result will range from 1-3 stars. The more stars you get, the more games you unlock. The main mode in each game is known as Remix and there are around 45-50 of these levels in each Remix. (1 and 2) Once you complete those you will have completed the game but you can keep on playing to clear the bonus world and any leftover game levels that you haven’t beaten yet. Obtain enough points and you will also get all of the stickers in each game which will really prove that you have come far. The simplicity of the game’s menu is certainly something to take note of as it makes navigating through the games rather enjoyable. More games should strive for a similar menu. An average challenge will range from 7 seconds to around 1 minute. You may find an occasional challenge that is around 2 minutes or so, but I can’t stress enough just how rare these are. The average challenge is around 20 seconds I’d say. For example, “Grab 8 coins in a Mario level” may be a challenge. Some challenges have multiple phases and if you get a game over during it you can continue but the price is that you will only get 1 star for your efforts. The game is rather lenient on stars so you can unlock the final level even if you lose during a bunch of the stages but naturally your goal will be to grab as many of them as possible. Of course with so many games not all of them will be a hit. From the first game the weak links were Golf and Donkey Kong Jr. I just never liked Golf in any video game format as it always seems to really be luck based. I know there is skill involved here and I just need to learn the mechanics, but it’s just no fun. Donkey Kong Jr. is just a little slow for me and I can see why it never became much of a hit. On the other side of the equation I thought that Excitebike was even more fun than I expected it to be and Clu Clu Land was really unique. I definitely enjoyed that one quite a bit. The only challenge in the first game that was quite grating was the Donkey Kong level where you played as Link. I must have died 100 times there before I finally found an opening. There must be a trick that I don’t know about for that one. In the second game, Wario’s Woods was the game that I couldn’t get behind. The controls were a little convoluted for my liking and the levels did tend to drag on quite a bit. It was like playing a really twisted version of Dr. Mario and I don’t really know what Nintendo was thinking on this one. All I can say is that I’m not surprised how the game isn’t very well known. I don’t see how it would catch on. The other game would be NES Golf, but I don’t believe I actually got enough stars to unlock that one. I’ll probably have it unlocked by the time I have my Stats page up, but I certainly won’t play it much. Meanwhile it was cool to have Metroid included this time around and Link II was also pretty interesting. It’s a shame that it didn’t do well since a 2D Link series would have been fun to compete with the others. It was rather rough around the edges of course, but they could have ironed that out with sequels. It’s like how the original Mario games were a little slippery, but they’re a lot easier to handle in the modern day. It’s important to clarify that the good games outnumbered the annoying ones quite easily. Also from the games that I didn’t care for, only the Golf games were truly bad. Donkey Kong Jr and Wario’s Woods may not have been my style, but it’s not like I actively disliked playing them. There is enough content here for everyone as even if you don’t like a game you can have fun with the rest. As I mentioned, the length of the game is pretty good. The first Remix took around 6-7 hours and the sequel was only a little shorter than that. Couple those two together and you have a reasonably long title. Then there is quite a lot of replay value here as getting 3 stars on every level will take a lot of practice and you will likely get all of the stickers on the way to accomplishing this feat. I do think it would have been cool if there was some kind of two player mode though. I think that’s the only thing that this game is lacking. Competing in these challenges would be an absolute blast and would certainly increase the replay value of the title. Still, as a single player experience it is not lacking. There is also the Super Luigi Bros where you see how far you can get in the Super Mario game while backwards and the Championship Mode where you are given 3 random tasks and have to see how well you complete them. They won’t keep you for very long, but each bit helps. Naturally the graphics are kept true to the original game counterparts so this isn’t exactly Madden. The main menu looks fairly crisp though which will remind you that this is a modern title. The games all look pretty good as well. The soundtrack is quite solid as well since the individual game themes have always held up well against the test of time. Then the remix levels add a little extra pop by distorting the stages and zooming in on the map. I loved the gimmicks they would add here to make the games a little more unique. One Mario level for example had a bright blue background which is a cool “What If” scenario. I think that would make a good idea for a future Mario level even if it’s just for a level or two. 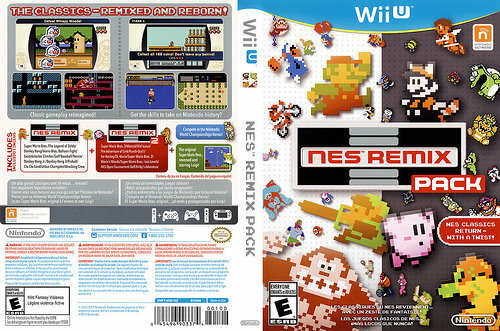 Overall, NES Remix Pack is a great homage/tribute to longtime Nintendo fans. It’s a great way to experience their older titles in a convenient minigame format. It’s the perfect kind of game for on the go or to play here and there. The challenges are fun and exciting without being tedious. This is where the short duration comes in handy as even if you die a bunch of times it is not as if you have lost a bunch of time. It never feels like a waste either since most of the challenges revolve around skill instead of RnG so you know that with enough practice you’ll get it. It’s also not too difficult so it’s fine for kids as well as they may have some trouble but will be able to crack the level eventually. There was certainly a lot of heart and effort put into this game to really make it a finished product. This entry was posted in 8 Star Games, Game Reviews, Games, Reviews and tagged Bowser, Donkey Kong, Game Review, Kirby, Legend of Zelda, Luigi, Mario, Metroid, NES Remix, NES Remix Pack, Punchout, Review, Super Mario, Video Game Review by dreager1. Bookmark the permalink. Sounds a bit like a Warioware made up of NES hits.